Life with Liya and Zain: Momma doesn't know to drive!! After a week, this was escalated as a serious issue. This is how the conversation went. L: Pappa, momma doesn't know to drive our red car. J : She knows. She takes you to school everyday. L: No, she doesn't know. I don't want to go with her anymore!! 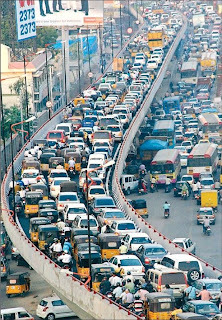 Pushing* >> 1st or 2nd gear, stopping at every 100 feet - Indian metros without huge traffic block is yet a day dream my girl!! Jumping* >> The gutters and speed breakers in the road- that's the beauty of Indian roads. Belling* >> Honking! - Hyderabad drivers get so offended if they are not allowed to honk and let others know that I have a horn too. So, no honking can only work in West! My dear girl, I am over qualified to drive in Hyd. The minimum qualification is that you should know to honk! The next time, when we all three were traveling, with J driving, I pointed all these to her. See car jumps when Pappa drives, see car goes pushing pushing in the traffic, see pappa honks!! Literally no sound I could hear from the back seat. Yes, someone was very seriously watching outside not hearing Momma's whining. Moral: Little girls are Pappa girls, nothing can change them. Don't waste your time!!! Disclaimer: This is not an attempt to degrade the system of my great country. Rather, I would suggest you to look at what I scribbled from the perspective of a wee girl, who have been through a sudden cultural change. Driving in Hyderabad is worse... The traffic is not just happening but creating because most of them think about themselves only... People break rules madly for 'apna apna' things... That's the issue!!! Driving in India is crazy, I cannot believe I used to drive there six years back :) Now when I visit all I do is cringe on the back seat with the honking, zig-zaging etc. She is such a daddy's girl! He he...I know! I wish if I had a chance to just sit and relax in the back seat! OMG, I couldn't do it. I am sure Liya is so used to the US traffic that she is just a bit impatient. I agree about the daddy's girl, lol. Yes, she only know that disciplined US traffic..:) Poor girl!